Teach your third grader the power of the decimal point. He'll practise decimal addition with this worksheet. The key to adding with decimals is lining up the decimal points. Help your fifth grader practise decimal addition with carrying. Decimals are a part of daily life, whether using them for measuring or counting money. practise adding up decimals with this worksheet! Money decimals are a little different than with plain numerals. 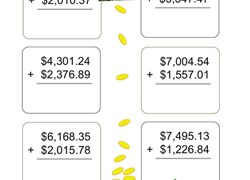 Have your student practise adding money sums with this addition worksheet. Kids practise six-digit addition with decimals in this year 6 money addition worksheet. Kids apply their money skills on this worksheet packed with three-digit decimal money problems. Let's get to the point: the decimal point, that is! In this worksheet, children practise adding decimals. Students use number lines to understand how tenths and hundredths are related as they add and subtract decimals. Help your child practise addition, subtraction, multiplication, division, and percentages with this fun maths maze worksheet. Assess your students’ knowledge of decimal concepts up to the hundredths place! Students will add and subtract decimals to solve increasingly challenging word problems. Students will practise adding and subtracting decimals, before applying the same skills to solve two-step word problems. Assess your students’ knowledge of decimal concepts up to the hundredths place, including addition, subtraction, comparing, and ordering. Darn those decimals! While doing maths with decimals can be tricky, here's a great worksheet to get your child in gear for maths. Challenge your students to solve two number puzzles that will have them adding and subtracting decimals. Stumped by decimals? Gain practise and confidence with this decimal addition worksheet. Students will solve two number puzzles that will have them adding and subtracting decimals. Adding up decimals is as simple as 1, 2, 3. 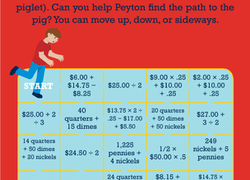 Your kid will get comfortable adding up decimals in no time! 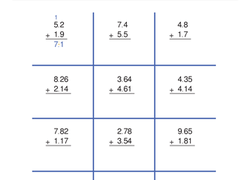 Dive into decimals with this worksheet that has students adding and subtracting decimals. 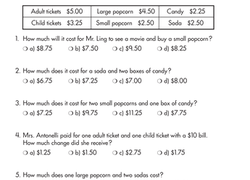 Third graders apply their money savvy as they complete money word problems at the movies. Don't let maths practise get your student counting sheep! In this worksheet, she can colour the sheep as she solves some addition equations with decimals. Here's a colorful review of addition with decimals! Your child will get to do some coloring as she solves each addition problem. This maths practise sheet gives your kid the help he needs to be cool, calm, and collected when it comes to subtracting decimals.